Our customer service experts speak to hundreds of customers each week. Here is a list of the most common questions. If you cannot find an answer, don't hesitate to contact us. Who are you? What makes Jewlr unique? We are a leading online retailer of personalised jewellery. Every Jewlr item is manufactured in North America and shipped directly to customers in the USA, Canada, Europe, and Australia. Every item can be highly personalised by selecting metals, gemstones, and engravings to meet your exact style. Jewlr is based out of Toronto, Ontario, Canada. All of our jewellery is proudly made-to-order in the United States and Canada. No. Jewlr is strictly an online retailer. Because we do not need to carry any inventory, we are able to offer exceptionally affordable prices for personalised jewellery. Yes, we have a one-year warranty against any manufacturing defects on all of our jewellery. Any damage sustained by misuse or alterations not done by Jewlr will void the warranty. Please view our warranty information page for more details. Jewlr’s Wish List is a convenient way to keep track of all those special items you want. Personalise up to 8 pieces with multiple customisations, save them to your list, and share with your friends and family. Wish lists are great for special occasions - let others know what you’re looking for, or share gift ideas for someone special. Jewlr is open Monday to Friday from 9am to 5:30pm Eastern Standard Time, excluding holidays. Our offices are closed over the weekend. As a thanks for signing up to our mailing list, you will receive a discount coupon code. Why was my coupon not applied to my order? Coupons are applied to all Jewlr purchases in your cart except for bundled items, gift wrap or premium gifts. Intermediate markdowns may have been removed in order to apply the coupon to the full order. Bundled items are optional, and are available to you at checkout because of the special item you are purchasing. Will the code be applied to items on sale? Coupon codes are applied to the regular price of each item after any multi-item discount is applied. If an item is on sale, the coupon will be applied to the regular price of the item. Between the sale price and the retail price of the item after the coupon code is applied, the price quoted to you at checkout will be the lesser of the two. What is a multi-level coupon? A multi-level discount coupon will discount your order in different increments based on the total value of your order. That is, the more you spend, the larger the discount. Are there any limitations to the amount of Jewls I can collect? There is no limit to the number of Jewls you can earn. You have 365 days to redeem your Jewls. Jewls will expire after 365 days. Can I lose my rewards status? You must continue to earn Jewls in order to maintain your VIP Rewards level. If you do not earn any Jewls in a 12-month period, your level will automatically reset to Sapphire. What happens to Jewls earned if I cancel my order? The Jewls you received from the cancelled order will be removed from your account balance. Can I collect Jewls on past purchases? You can only start collecting Jewls from the time you sign up and create your VIP Rewards account. Will I get Jewls for upgrading my shipping? If I pay for an upgrade on my item in the future will I get more Jewls? Do I get Jewls for the original price of the item or the sale price? You will earn Jewls based on the final price you pay for an item. How do I merge my accounts and balances? Can I use my reward Jewls and my friend’s reward Jewls on the same order? You will only be able to use your Jewls on your own orders within your own VIP Rewards account. Why were my Jewls not increased after I purchased something? Once your purchase has been completed, your rewards balance will be updated immediately. Can I give my Jewls to someone else? You will not be able to transfer your Jewls between accounts, however, if you would like to purchase a gift for someone else with your Jewls, you can do so. Do I get Jewls for referring someone? We are expanding our VIP Rewards program to include more features in the future. Can I get my entire order free if I have enough Jewls? Yes, you can pay for your entire order in Jewls as long as you meet the minimum spend and the minimum amount of Jewls. Yes, we have a referral program as part of our VIP Rewards program. The referral program allows our customers to refer their friends and family. In exchange, both parties will receive a €20 reward. You can refer your friends and family by sharing your personal referral link. Those you refer will receive an instant €20 (4000 Jewl) reward that they can apply to their first purchase. After the person you referred has completed their purchase, you will receive a €20 (4000 Jewl) reward to use towards your next purchase. You can see your Jewl balance in your VIP rewards account and can redeem your Jewls for money off of your order during checkout. How many times can I receive a reward for referring someone to Jewlr? You can receive up to €100 in rewards by referring others. What if the person I referred cancels their order? The balance of Jewls will be reverted to its previous level. Do I have to make an account to get the €20 reward? Yes, in order to participate in the referral program, you must create an account. Is there a fee for this program? No, this program is absolutely free. No, you can not refer yourself. Can I refer someone in another country? No, you will only be able to refer those who live in the same country as you. Birthstones are gemstones that are traditionally associated with the twelve months of the year and are available both genuine and simulated. Certain birthstones such as diamonds, sapphires, emeralds and rubies are scarce and therefore more valuable, and may increase the cost of your customised item. What is the difference between simulated gemstones and genuine gemstones? Simulated (sometimes called synthetic) gemstones are created in labouratories and emulate the characteristics and look of genuine gemstones. For example, cubic zirconia is a diamond simulant composed of zirconium oxide. Simulated stones tend to be vivid in colour as impurities are not present in a lab, and therefore do not modify the clarity or hue of the stone. Why should you include Genuine Gemstones in your Jewellery? Genuine gemstones add exceptional worth and natural beauty to all jewellery. Genuine gemstones are rarer and much more valuable than simulated gemstones and this value stays with the jewellery item forever. All of Jewlr’s genuine gemstones are A-AA quality and purchased from industry-leading suppliers. We continually strive to obtain the highest quality stones and offer them to you at a competitive price. Jewlr's diamonds are all conflict-free, G-I in colour and at least I1 in clarity. We also offer a wide range of centre diamonds that can be purchased by speaking with one of our diamond experts over the phone. All larger centre stone diamonds are accompanied by a labouratory report from a reputable third-party. Why aren't my birthstones offered for a particular item? Because we are not able to offer birthstones in all stone shapes and sizes, certain stones may not be available for every style of jewellery. SWAROVSKI ZIRCONIA does not offer all the birthstone choices. SWAROVSKI ZIRCONIA stones are flawless simulated diamonds. The SWAROVSKI ZIRCONIA stones used in our jewellery are cut to the Swarovski Pure Brilliance standard, which offers the same brightness (brilliance) as the highest brilliance cut Tolkowsky Diamond. You can choose from 11 different colours to create a totally unique design. Is SWAROVSKI ZIRCONIA the same as Swarovski Crystal? No, SWAROVSKI ZIRCONIA is made from Zirconia, which shares properties similar to a diamond and in many cases is visually indistinguishable from a diamond. What quality of diamonds are offered with your jewellery? The diamonds we use vary depending on the style and design of the item. If you have specific questions regarding our diamonds, please call us to speak with one of our diamond experts or visit our Diamond Info page. What is a Jewlr Gift Card? The Jewlr Gift Card is an electronic gift card that can be used to make purchases from our Jewlr website. Gift cards are available for purchase online here. Where can I get the Jewlr Gift Card? The Jewlr Gift Card is available for purchase online at Gift Cards. Can I get it replaced if it’s lost or stolen? If lost or stolen, Jewlr cannot offer a replacement or refund for gift cards. The Jewlr Gift Card will not be returnable or exchangeable for cash (except in states where required by law). Can I use my coupon code to purchase an Gift Card? Coupon codes and other discounts may not be used to purchase Jewlr Gift Cards. Can I use my EU Jewlr Gift Card in the U.S. and vice versa? Jewlr Gift Cards must be used in the currency they are given. A €EUR card must be used on the European site. Does my Jewlr Gift Card expire? The Jewlr Gift Card does not expire. What fees are charged to my Jewlr Gift Card? No fees are charged to your Jewlr Gift Card. How can I protect myself from fraud when purchasing a Jewlr Gift Card? Jewlr Gift Cards can only be purchased only from jewlr.com. We do not authorize any websites or individuals to sell the Jewlr Gift Card on our behalf, and discourage you from purchasing gift cards from these unauthorized sources. Jewlr is not responsible for any issues you experience with Jewlr Gift Cards not purchased directly from our website. What happens if I don't have enough money on my Jewlr Gift Card to pay for my purchases? The balance of your Jewlr Gift Card can be put towards your purchase and the remainder can be paid by credit card or paypal. It's possible that you've forgotten a visit or purchase. You can check your card's remaining balance online at Jewlr.com or by contacting us. The value remaining on a Jewlr Gift Card may not be redeemed for cash unless required by law. How do I use my Jewlr Gift Card? To use your Jewlr Gift Card, simply go to www.jewlr.eu and personalise the item you wish to purchase. Once you are finished personalising the item, add it to Cart and then go to Check-out. Review your purchase. If everything is as you expect, enter your Gift Card # in the Gift Card field. Whatever balance remains on your Gift Card will be applied to your purchase. If there is a positive balance on the Gift Card you will be able to apply that to another purchase in the future. If there are insufficient funds on the Gift Card for the purchase, then the amount on the Gift Card will be applied to the purchase and you can submit the balance using any one of our other payment methods. Each time you use the Jewlr Gift Card, the amount of your purchase will be deducted from the balance remaining. How can I check the balance on my Jewlr Gift Card? The balance on your Jewlr Gift Card can be checked anytime online or by contacting us. No purchase is necessary to check your balance. Can I use multiple Gift Cards to make one purchase? Yes, you can use multiple Gift Cards in one purchase. In the Order Summary of the Secure Checkout you will be able to enter each card one at a time until the cart is at a zero balance or until you have no more money on your Gift Card. What happens if the recipient didn't receive their Gift Card in their inbox? The recipient will receive the email based on the delivery option you selected and you will receive a confirmation email of your order. If the recipient has a filter on their email, please add jewlr.com to the recipients white list or have the recipient check their filtered email. Family Jewellery can be a ring, necklace or bracelet, for a grandmother, mother, or daughter that is set with the birthstone of each family member. Some family Jewellery is engraved with each family member's name or just the family's surname for that added personal touch. All Family Jewellery products carry a theme surrounding families. What is a Mothers Ring? A Mother's Ring is a symbolic ring that represents a Mother's love for her child or children. It is customary to include the parents birthstones on a Mother's Ring, but having just the child's or children's birthstones is also common. Often, these items are further personalised with custom engravings of children's names or the family surname. What is a Grandmothers Ring? This special ring features the gemstones of the Grandparent's children and her children's child or children. Alternatively, it can feature just the grandchild or grandchildren's birthstones. Styles range from 5 to 12 gemstones. What is a Daughter's Ring? A Daughter's Ring typically has 3 gemstones, but not always, with a predominant or centre birthstone representing the daughter's birth month. Two smaller birthstones represent the birth month of the Mother and Father. What is a Couples Ring? A couples ring is a cherished keepsake between sweethearts; these rings have 2 stones representing the birth months of the couple and often include personal engravings. Cobalt jewellery and cobalt rings are primarily made of cobalt, but more accurately they can be called Cobalt Chrome rings and Cobalt Chrome Jewellery. Made of a highly durable cobalt alloy that has been used in medical implants and the dental industry for years, cobalt jewellery employs the same cobalt chrome alloy from these industries for its extreme strength and high resistance to scratching. Cobalt jewellery is also quite malleable in the right craftsman's hands, and as a result can be worked into a vast array of unique styles and almost unlimited in its potential. What is the difference in font styles? Classic- This is a timeless font, easy to read and see. This font is best when you want your engraving to be very legible. Modern- This is an effortless, more rounded font. The text style is soft and gentle while still being bold. Italic- This font is slightly slanted and thinner in width. It is sleek and classy in appearance. Cursive - This is a dainty and elegant script font that, because of how fine it appears, can be a little bit more difficult to read. How do I untangle my chain? To safely untangle your chain without damage, you will need two fine-point needles and a dab of oil (baby oil, olive oil, vegetable oil, etc.) First, place the chain on a flat surface, as holding the chain up may tangle it further. Unclasp the chain and rub the knot with a little bit of oil. With the two needles, start loosening the knot from the centre out. Focus on the centre of the knot and expand it. Once the knot is expanded, follow each chain moving each as you go. Go slowly- patience is key! Once your chain is tangle-free, dip the oily part in a mixture of warm water and mild detergent. Dry thoroughly. First and foremost, avoid chemicals as they can alter the metal in your jewellery. Remove your jewellery when doing any household cleaning or wear rubber gloves to prevent chemical contact with your piece. Also, avoid chlorinated pools or hot tubs while wearing your jewellery as these will speed up the tarnishing process. We also recommend you apply any perfumes, cosmetics, and hairspray before putting on your jewellery as the chemicals may dull the shine. Store your jewellery in a clean, dry place. Exercise care when wearing your piece as stones can chip if hit on hard surfaces. Avoid harsh chemicals, and clean your jewellery regularly. Jewlr uses only genuine sterling silver containing 92.5% silver. Because sterling silver is a soft metal, the remaining 7.5% consists of an alloy, usually copper, to increase the hardness. Sterling silver is stamped with 925, .925 or 92.5, as opposed to a karat stamp. What is the difference between 10K & 14K gold? The term "karat" designates the amount of gold found in a piece of jewellery. 24 karats is pure gold, but it is generally mixed with other metals to produce a harder, more workable alloy. For example: 14 karats (14K) indicates that 14 parts out of 24 are pure gold. Jewlr offers a selection of 10K and 14K white, yellow, and rose gold. Cobalt is element No. 27 on the Periodic Table. It is often found in nature bonded to nickel or copper. When isolated, cobalt is well known for its deep blue colour. What colour are the Cobalt rings? As its name implies, when found in nature, cobalt is a deep blue in pigment. However, when used in Cobalt Chrome rings it is more similar to white gold or platinum. The Cobalt Chrome rings are a lighter metal and do not require rhodium plating to maintain its white hue. The 1973 Hallmarking Act makes it unlawful to describe an item over a certain weight as gold, silver, platinum or palladium without an independently applied Hallmark. What choices of chain do you offer? We offer sterling silver cable chain in 14", 16", 18" and 24". In 10k or 14k white, yellow and rose gold, we offer diamond cut cable and rope chains in 14", 16" and 18" lengths. Letter size will vary depending on the style and font that you select. On average, the height of a capital letter is approximately 12 mm. What is the difference between the rope and upgraded curb chain? The main difference between both chains is the look of each. The rope chain consists of many small links crafted to give the effect of two strands spiraled together. The curb chain consists of links that interlock with each other when laid flat. The chains also differ in thickness. The rope chain is approximately 0.5mm thick, while the curb chain is slightly thicker at approximately 1mm. Do your charms fit on a Pandora bracelet? Yes, all our charms are designed to fit on Pandora bracelets or those of a similar style. What is the diameter of the inside of the charm? All our charms have a centre diameter of 4.6mm. For all item specifications, you can click on the “Item Details” dab on the customisation page. Will my ring look exactly like the preview image on the web site? 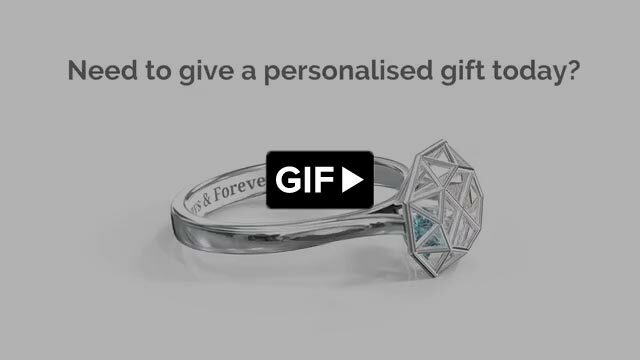 When you personalise a ring on Jewlr.com, you will see a preview of your item with your selected options. This preview is intended to give you an idea as to what your item will look like. Though we do our best to provide an accurate representation of the actual item, there may some differences (e.g. with respect to stone colours and size). Please ensure to review the item details which outline stone shapes and sizes. All orders placed during regular business hours will be processed within 24 hours. All orders placed on weekends or holidays will be processed within 24 hours of the following regular business day. The approximate delivery time commences once your order has been processed. I need an engraving that is longer than the allowed number of characters. Can you still do it? Possibly. There may be certain styles where additional characters may be allowed if we feel that the addition will not compromise the design. Please email us with the specific item style code and desired number of characters when inquiring. Are special symbols or characters permitted in an engraving? No, unfortunately we cannot engrave special symbols and/or characters at this time. Once you have placed an order you will receive a confirmation email with an order number and your account information. You can use your account information to check on the status of your order. You do not need to sign up for an account to make a purchase from our site. Do you put the purchase receipt in the box? There are no receipts put in the box so that it can be shipped directly to someone as a gift. The only receipt you will receive is by email with the order confirmation email. What package will arrive at my door? All orders are placed inside a nondescript tamper-proof courier bag. Every order is packaged in our signature Jewlr packaging, designed to complement the elegance of your custom Jewlr item. The luxurious gift box is also made to protect your jewellery. Inside you will find a Certificate of Authenticity that details the personalised attributes of your item, an optional free gift message, a complimentary piece of costume jewellery and, of course, your special purchase. Each item is mounted in one of our stylish jewellery boxes, perfect for presentation and safekeeping. What type of pearls do you use? We use undrilled, freshwater round pearls. How do I care for my pearl? It is very important you do not expose your pearl to any grooming products like hairspray, body lotion or perfume. Pearls can be washed using tepid water mixed with a little bit of dish soap to remove any body oils that may stick to the pearl. Let the pearl dry naturally on a soft, dry cloth. This procedure will help maintain the glow and luster of the pearl. What type of chain comes with a pendant? All of our pendants come with a corresponding chain, the style of which will depend on the metal you use choose for your item. When you customise the pendant, you will see the different chain options available for that pendant. What is the difference between the curb and rope chains? The main difference between both chains is the look of the chain. While the rope chain may be a little more sturdy than the curb both of these are very high quality. The rope chain gives the effect of two twisting strands spiraled together and this is created by many small links. The curb chain is when the links interlock with each other when laid flat. What type of clasp is on the chain? All of our chains come with a springing clasp. At this time, we do not provide any other clasp options . We offer a 99-day return policy in the event you are not completely satisfied with your purchase. The item must be returned unworn and in its original condition, with the plastic jewellery tag still attached. Fill out our Return Request Form and a customer service representative will send you the return instructions. The return must be postmarked to us prior to 99 days after the original shipment date. Your item will be inspected, after which a full refund will be issued, minus shipping and gift wrap costs. Please allow 1-2 weeks after we receive the return for your refund to be processed. My sterling silver ring is tarnishing. What should I do? Your genuine sterling silver item can tarnish when exposed to the environment and to everyday products such as perfumes, colognes, dishwashing soap, hair care products, lotions, creams and more. Anti-tarnish silver polishes are available for purchase at most specialty stores and/or jewellers. We currently ship directly to customers in the US, Canada, Europe , and Australia. For customers in other countries we do offer a solution with our partner, International Checkout Solutions. See ournternational Orders page for more details. How much is delivery? Do you offer free delivery? Yes, we offer free delivery to all our customers in the United States*, Canada, Europe and Australia. View our delivery information page for more details. For our New Zealand customers we now offer shipping at a discounted rate. Every item ships within 3 to 10 business days from the order date. Estimated ship dates are provided for each item at checkout. Shipping to USA and Canada takes an additional 3-5 business days. Please also remember that shipping times do not include manufacturing time, which varies between 3-8 days. While we make every effort, we cannot guarantee delivery within these estimated times. If you are in a rush, take a look at the Quick Ship Collection to browse those products manufactured the fastest. What if I need my item sooner? We offer an expedited shipping option to most locations in North America. Express shipping is 1 - 2 business days. These shipping times do not factor in the manufacturing time. Upon request, we can try to expedite the manufacturing of your order, though we do not guarantee that we will be able to fulfill your request. To make an expedited request, after placing your order, please email us at customerservice@jewlr.com with your order number and desired date of delivery. We also include a Jewellery Certificate with every item. Your official certificate can be downloaded, printed and presented to your loved one to let them know that their special gift has been ordered and will be delivered shortly. Can I upgrade my delivery method after my order is processed? Yes, as long as your item has not been shipped yet, we can upgrade your shipping method (if the option is available). Please contact a customer service representative to do so. All items are made in our North American factories. We ship with FedEx, Canada Post, UPS, USPS and Royal Mail depending on location and service. What countries do you currently deliver to? We currently deliver directly to customers in the US, Canada, Europe, Australia and New Zealand. For customers in other Countries we do offer a solution with our partner, International Checkout Solutions. See International Orders page for more details. Do you deliver to APO's, FPO's and P.O Boxes? Yes. Delivery times may vary. Please allow additional delivery time if shipping to APO, FPO or PO Box. Once I order, how long does it take for me to get my item? All of our items are custom made to order in North America. The estimated time for manufacturing for a particular item is listed on the item's product page. Many of our styles are made in 3-8 working days. You can estimate when you will receive your item by adding the manufacturing time to the delivery time from the date of your order. We are pleased to offer FREE Standard Delivery on all items to Europe. Do you have a Jewlr credit card? Jewlr offers a Jewlr Gift card which can be used for any Jewlr item. The Jewlr Gift Card is an electronic gift card that can be used online at Jewlr. It is the convenient and easy gift to give when you’re late or when you just don’t know what to give!